Back in the day, way back in elementary school, my 4th grade class was given the amazing gift of AOL. In 2012, I’m sure this doesn’t seem that awesome but back in 1994 this was the jam. At the time, they had one of their headquarters in Palo Alto, one of the cities in the Silicon Valley that I grew up in, and I was lucky enough to have a classmate with parents who worked there. They waltzed into our class one day when we sat down for “computer lab”, which meant walking to the left side of the classroom and pairing up with a group of friends in front of a Mac II, and loaded the application onto our computers. At the time, we used AOL to talk to participants in the Iditarod. We talked them up about their dogs, the history of the event and how goshdarn cold it must have been. At the end of the day, we got to take home a trial version, which found permanent places in all of our hearts. As I grew up, so did the social aspects internet. AOL introduced the “Chat Room” shortly after my parents signed up; I spent an exorbitant amount of time IMing old friends, making new ones, manipulating my user profile and enjoying their integrated news and media feeds. AOL turned into AIM and my friends and I branched out into blogging on sites like Xanga, LiveJournal and DeadJournal. MySpace and Facebook became public around the same time in 2003; only Facebook was still an elite social endeavor, rolling out first to Ivy League schools in 2003. In September of 2004, the beginning of my sophomore year of college, UCSB was added and I dove in head first. The social video sharing site, Youtube, emerged in 2005 and Tumblr, one of the best microblogs around, made it’s first appearance in 2007. Tumblr was, and in my opinion still is, the best of all social worlds – I could add Videos from Youtube, news articles from whatever source I chose, audio files, photographs and regular posts. I jumped on the Tumblr bandwagon immediately; I purged through my old posts, transferring some, removing others and ultimately deleting my other blogs. In 2008, I finally deleted MySpace and picked up one fabulous internet addiction after the other; first came Twitter, then the onslaught of Yelp, Instagram, Hypem, Foursquare, Spotify, Pinterest, etc, etc. Now, in 2012, Social media is more about promoting the individual – whether it’s a person, band or product – and less concerned with connecting individuals into a community. On both Twitter and Facebook, brands have the ability to pay for – or promote– posts to larger audiences. But,it’s hard to argue with these tactics as a consumer, since these ventures are (relatively) free. Over time, the number of nuanced networking sites have grown exponentially and older sites have gone on missions to rebrand themselves, with hopes of both gaining new demographics and restoring popularity amongst new and former users. Unfortunately, we’ve reached a point where the supply and demand for social networking sites is skewed; when you go and “check in”, do you check in on Facebook? Or do you check in on Foursquare or Yelp and integrate it? As a heavy user, it’s a valid question. The market is more or less over-saturated with social media and it’s forced my generation to pick and choose our battles wisely. Out of my group of friends, I’d say maybe 5% still use MySpace – and that’s a generous 5%; those that use it primarily go for the music and then don’t find a reason to stay. But there’s a chance that this could all change! MySpace has undergone extreme rebranding in attempts to reign users (back) in. The only question is: with all of the social media ventures that have emerged in the time that MySpace was more or less out of the game, will users care enough to cultivate new interest? If I hadn’t deleted my page, I might be willing to go back – but the idea that I’d have to start from scratch is a major deterrent. Over in the Tumblr camp, they’re preparing to roll out contact analytics to users come November. Amongst the tracked metrics are – volume, overall engagement of a post, post performance and reblogging. Currently, it’s in beta – but if you want to get your tumbling little paws in on the action, head over to the Union Metrics website and sign yourself up! 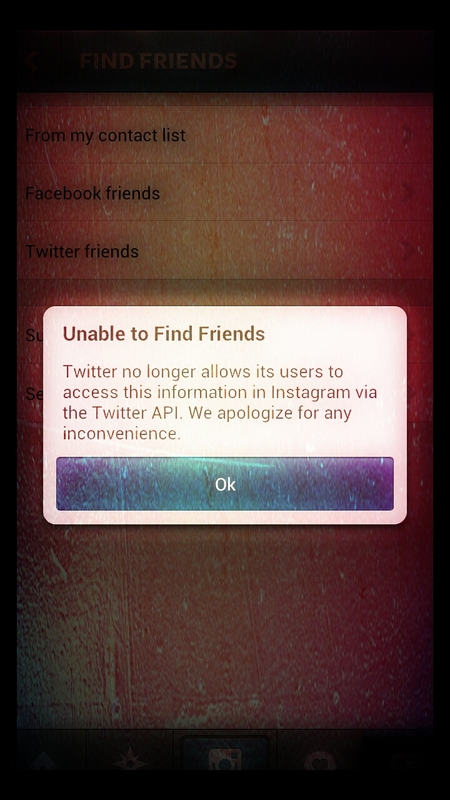 This morning, I was trying to search for a few Twitter friends on Instagram and I was greeted by the following message – “Twitter no longer allows its users to access this information in Instagram via the Twitter API”. Say what?! Apparently I’ve been hiding under a rock for the last few weeks because this change was implemented back in August. The good news is that we’re still able to post our pictures to our Twitter account and applications like Foursquare still have API access, but it raises the question – was Instagram banned from the API because they were bought by, and integrated into, Facebook? Today also marks the launch of the Twitter User Directory, which was added to the bottom of the home page, letting users and non-users alike earch the Twittersphere.